Merely 102 km with 508 m of climbing – this is the easiest day of the tour, and like the day before it hardly deserve the label „riding day“. 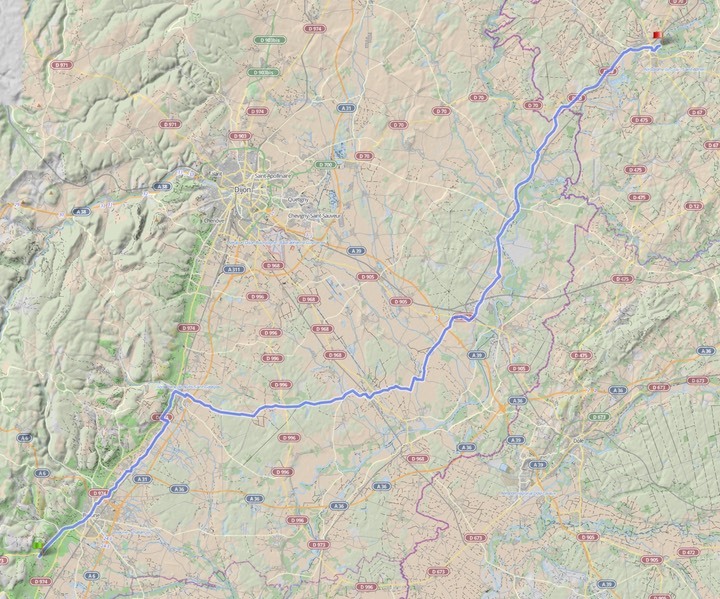 I had played with the routing options for a bit, but then thought that we have actually seen a whole lot of France and have had a number of quite demanding days in the heat of summer, so we deserve two days of relaxation with good food and wine. So, a certain minimum of movements won’t hurt and we get to see a bit more of Burgundy. It is interesting to see how small this area actually is where world famous wines are cultivated. Breakfast I would recommend to take in Beaune, the largest among the wine growing towns. Heading north, we will stay with the wine for a bit until we reach Nuits-St-George, another one of those famous and fancy places producing world class wines. If you don’t want to explore, just follow the track which will turn east now and takes a wide loop around the city of Dijon, the historic capital and seat of the Dukes of Burgundy. It gets just a bit hilly as we roll along, nothing spectacular, practically flat after what we have done earlier in the week. 81 km into the ride we have left the Saône valley and will do some gentle climbing before coming back to the river at Gray, our destination for the day.